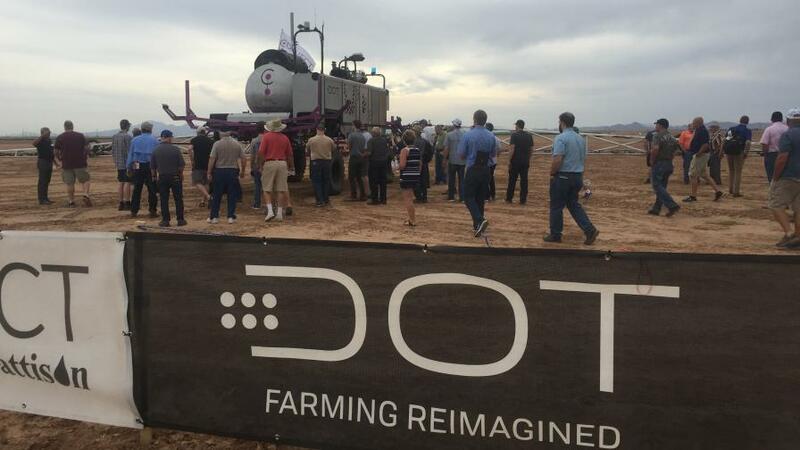 Attendees at the DOT Demo Day on March 27 at the University of Arizona Maricopa Research Farm got an up-close look at DOT Technology Corp.’s autonomous farm robot. 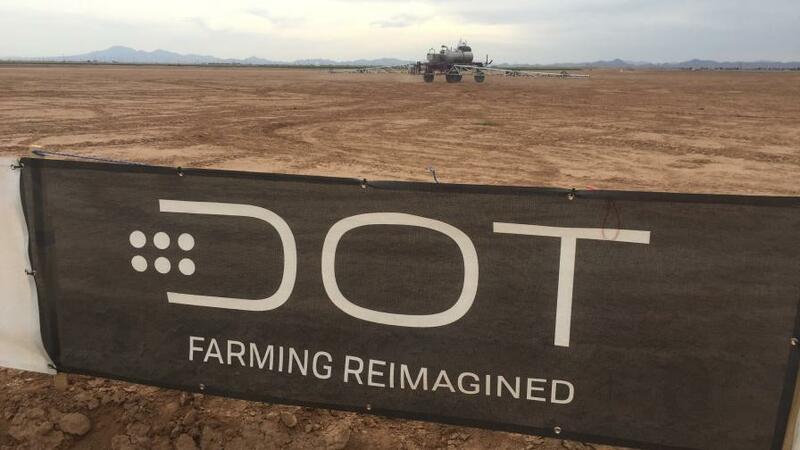 Attendees at the DOT demo day held at the University of Arizona Maricopa Research Farm may have gotten a glimpse of a future that is about to become a reality. The DOT Technology Corp. is preparing for commercial launch of its fully autonomous farm robot this spring, with pre-ordered units beginning to be delivered in May 2019. A close-up of DOT Technology Corp.’s autonomous farm robot — DOT. In addition to seeing the machine run in the field, attendees were among the first to hear some exciting new announcements about partnerships for “DOT Ready” implements that expand field operations. Development of DOT began five years ago with an idea and rough sketch by Norbert Beaujot, the visionary founder of SeedMaster based in Saskatchewan, Canada. The design features an innovative U-shaped frame, with the powerplant off to the side of the machine. Implements are attached by simply driving into them, after which they fasten to hook-shaped couplers. The machine will then conduct autonomous field operations, which can include planting, applying fertilizer, spraying, and helping with harvest. With such an innovative machine, it’s unsurprising to hear a litany of new vocabulary. Among these are DOT 3000 Power Platform and DOT Ready Implements, the names given to the autonomous machine and its compatible implements, respectively. The DOT Technology Corp. has been hard at work developing their own implements with sister company SeedMaster, in addition to establishing relationships with other manufacturers. The list of DOT-Ready Implements will include a seeder manufactured by SeedMaster, a liquid fertilizer coulter bar, a sprayer manufactured by Pattison (pictured) featuring Raven Industries’ Hawkeye system for nozzle control, and a grain cart. At the time DOT is launched in just a matter of weeks, the list of DOT Ready Implements will include a seeder manufactured by SeedMaster, a liquid fertilizer coulter bar, a sprayer manufactured by Pattison featuring Raven Industries’ Hawkeye system for nozzle control, and a grain cart. Also announced at the demo day was an exciting partnership with New Leader Manufacturing, one of the leaders in nutrient application equipment. They will be bringing technology from their G5 series of spreaders to the DOT platform, enabling features such as variable rate nutrient application and swath width control. After sitting through a series of educational presentations about DOT and related product announcements, attendees at the demo day were invited to see the machine run outside. 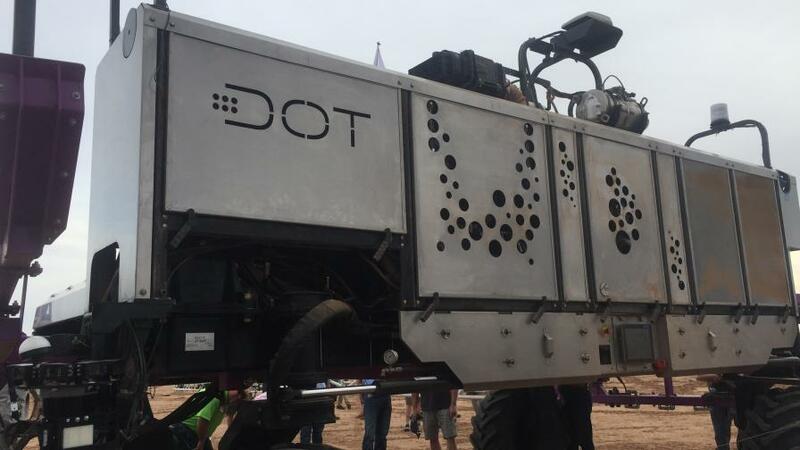 DOT’s crew remotely started the power platform, which is powered by a 173-horsepower Cummins engine, and in a matter of minutes coupled it to a Pattison sprayer. The Pattison sprayer featured a 1,600-gallon tank and 120-foot aluminum booms. DOT shouldered the weight of the implement without any difficulty, and soon proceeded to autonomously spray the field, navigating with the help of GPS and a series of sensors at the front of machine. The instruments that help the machine navigate safely include an array of radar and LiDAR sensors, which continuously scan the path ahead. If these sensors detect an obstruction, such as a person or other object, the machine will stop and alert a designated contact on the farm. The machine also has many other sensors that monitor the status of the machine and field. This includes functionality that detects field roughness, which will create a map that can be viewed later to identify areas of concern and will also be used by DOT to slow the machine down automatically in challenging areas. While the machine certainly seems ready for a commercial launch, there are still many obstacles to adoption on the farm. These include developing a dealer network with qualified support personnel, the challenges of transporting the machine between fields, and convincing growers of the value of the machine. DOT Technology Corp. is diligently working to solve many of these hurdles, and are in the process of developing a dealer network, forming partnerships with other shortline manufacturers, and advocating for solutions that will allow for the safe operation of autonomous vehicles on public roadways. The process of swaying the view of farmers to consider autonomous machines, such as DOT, may be a longer process. DOT Technology Corp. is hoping that the adoption of machines such as theirs will be akin to the acceptance of the automobile at the turn of the 20th century or, more recently, the sweeping adoption of smartphones. 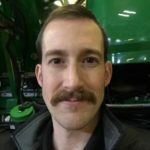 While only time will tell, it appears that the dawn of autonomous machines is about to begin, and DOT is uniquely positioned for success being one of the first robots ready for broad-acre farming.